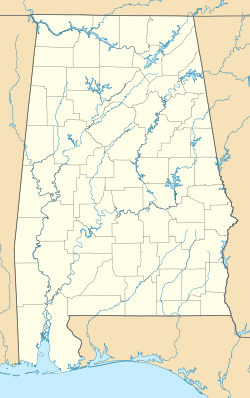 Pryor Field Regional Airport (IATA: DCU, ICAO: KDCU, FAA LID: DCU) is a public airport located three miles (5 km) northeast of the central business district of Decatur and south of Athens, in Limestone County, Alabama, United States. It is owned by Decatur/Athens Airport Authority. Situated next to Calhoun Community College, the airport serves the western portion of the Huntsville-Decatur Combined Statistical Area and most of the Decatur Metropolitan Area. Pryor Field is currently the busiest regional airport in Alabama. Pryor Field Regional Airport covers an area of 200 acres (81 ha) which contains one asphalt paved runway (18/36) measuring 6,107 x 100 ft (1,861 x 30 m). For the 12-month period ending May 3, 2006, the airport had 167,701 aircraft operations, an average of 459 per day: 91% general aviation, 7% military and 2% air taxi. There are 144 aircraft based at this airport: 79% single engine, 14% multi-engine, 3% jet aircraft, 3% helicopters and 1% gliders. Opened in October 1941 with 4,600 by 4,600 feet (1,400 m × 1,400 m) square all-direction turf runway. Began training United States Army Air Corps flying cadets under contract to Southern Airways, Inc. & Southern Aviation Training School, Inc. Assigned to Gulf Coast Training Center (later Central FLying Training Command) as a primary (level 1) pilot training airfield. Flying training was performed with Fairchild PT-19s as the primary trainer. Also had several PT-17 Stearmans and a few P-40 Warhawks assigned.Inactivated on December 28, 1944, with the drawdown of AAFTC's pilot training program. Declared surplus and turned over to the Army Corps of Engineers on September 30, 1945. Eventually discharged to the War Assets Administration (WAA) and became a civil airport. A newly built $1.8 million terminal building opened in 2008 at the north end of the field as part of a federally funded $3.3 million project. This also included lengthening the runway to 6,000 feet (1,800 m) to accommodate larger jets and improve safety. In January 2010, the pilot training site was designated a historic landmark and added to the Alabama Register of Landmarks and Heritage. In 2007, Chris Wright was struck by a propeller as he was "hand propping" starting his plane. He received a gash to the head, but recovered. In 2009, Steven Raddatz was killed when his Van's Aircraft RV-8 collided with Russian-made Yakovlek owned by and B.J. Kennamore, the latter of which landed safely after the collision. ^ "Rivers, rails, roads, and air". Decatur Daily. October 1, 2006. ^ Haskins, Shelly (January 19, 2011). "World War II pilot training center at Pryor Field named a state landmark". Huntsville Times. Retrieved January 20, 2011. ^ "Pryor Field designated as a historic landmark". The News-Courier. Athens, AL. January 20, 2011. Retrieved January 20, 2011. Shaw, Frederick J. (2004). Locating Air Force Base Sites History's Legacy. Washington, DC: Air Force History and Museums Program, United States Air Force. This page was last edited on 30 January 2019, at 03:54 (UTC).